RED HOOK — Mary Dudine Kyle was walking down Conover Street with her two young children soon after moving to Red Hook when she saw a man emerge from a bar in the middle of the block. "It was golden orange sunlight" as Sunny Balzano, the barkeep who ran Sunny's Bar, approached her more than a decade ago, she recalled. "He touched my cheek and said 'love,'" she said. "And that was how I met Sunny." Friends, family, patrons and other local business owners repeated that image of light as they gathered Tuesday morning to mourn the legendary bar owner and artist, who died last week at 81. "Red Hook is not the same without Sunny," Father Claudio Antecini said at the funeral Tuesday morning at Visitation of the Blessed Virgin Mary. "He was a very bright person who illuminated with his joy." Balzano's wife, Tone Johansen, remembered Sunny as a spiritual man. The prayer to St. Francis, which reads, in part, "where there is darkness, light; where there is sadness, joy," was his favorite. "He had an excitement for life and an appetite for life," she said. After the funeral, a procession began outside the church with a block-long line of mourners led down Richards Street by a jazz band. 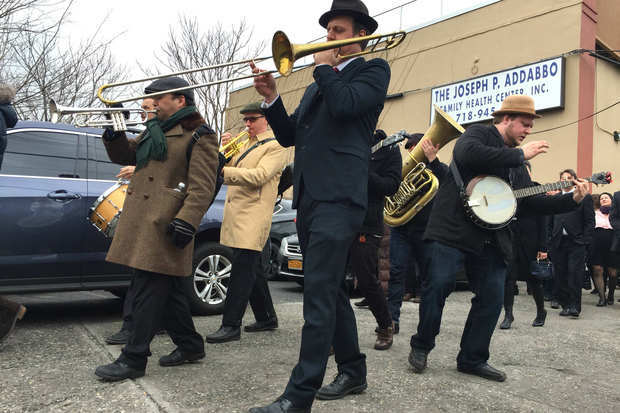 Turning onto Beard Street, they crossed Van Brunt Street before ending up at Sunny's Bar, where mourners gathered to sing, dance, cry and celebrate Balzano's life at his century-old family business as the band continued to play. Music, dancing and mourning at Sunny's Bar for Sunny Balzano. The rusty truck that sits outside the bar was covered with notes, flowers and a pack of Marlboro cigarettes. Christina Cipriano, who has worked in the bar's office with Johansen for three years, said Balzano was one of her best friends. For most of those years, Cipriano, a photographer, had been documenting Balzano, who was no stranger to attention from authors, filmmakers and journalists. "Every time I would get the camera on him, he would light up," Cipriano said. "He's a special human being," she said. "He just always brought out the best version of who you are."